The Battle of Leyte Gulf took place on October 24 and 25 in 1944. Without a doubt it was the final battle in the history of the world where naval surface combatants were in actual physical sight of each other. In John J. Gobbell's A Call To Colors he takes us back to that tenuous time late in the war when most of the strategic minds within the U.S. and Japanese militaries were certain of one thing. The Japanese had lost the war. The questions that remained were, how would the remaining resources of the Japanese armed services be used. Gobbell has constructed a fictional account of an American destroyer and her crew and placed them in the unenviable location of the famous squadron of ships known to most World War II historians as Taffy 3. The under armed, outnumbered men of Taffy 3 faced the most powerful force of Japanese warships ever assembled, all centered on the super battleship Yamato. Gobbell's account of the battle concentrates on Commander Mike Donovan, Captain of the destroyer USS Matthew, taking us through the events that lead Donavon from his terrifying experiences during his first engagement with the enemy to his taking command of the Matthew. Interspersed are two side stories. The first involves the U.S. military railway and how it underwent some determined foreign sabotage. This story does deviate from the Donovan story--just when you want to know more. From a historical standpoint, the military railway story is very interesting, and Gobbell does use it to tie a lean parallel story concerning an estranged friend of Donovan's now back into his life, however the book could have stood alone without it. The second perspective is a Japanese point of view and is helpful because the Japanese simply don't write about their failures in WWII. I have no doubt this is a fictional account, but without the real thing, this is a great addition to the book. The writing is good; and the character development is paced well. From a historical standpoint, everything appears to be in the right place. 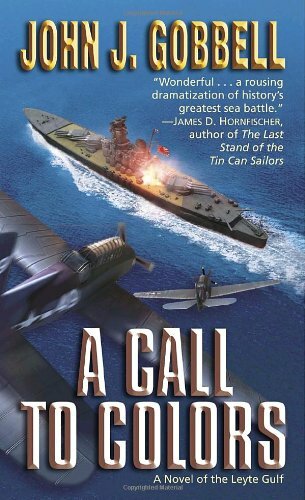 Armchair Interviews says: Anyone who likes a good historical WWII fiction can't go wrong with A Call to Colors.